Suzanne Godsey | Vision Financial Group, Inc.
Suzanne attended Samford University. She has over fifteen years of experience in banking and investments. 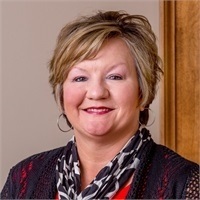 She has worked for AmSouth Bank, with over eight years service in their Bond department, also with Wachovia Securities and Shelby County Board of Education before joining Vision Financial Group in January 2011. Suzanne now serves as Director of Service for Vision Financial Group. Some of her responsibilities include processing new business, keeping clients up to date with the status of all new accounts, and handling service issues for new and existing clients. Suzanne enjoys sporting events, shopping, and spending time at the lake with family and friends. She and her husband Mike have been married since May 1986. They have three sons, Ryan, Blake, and Bailey. They go to Westwood Baptist Church.